Hi, folks. 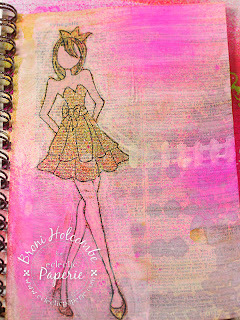 It's Broni here today to show you one of my journal pages. 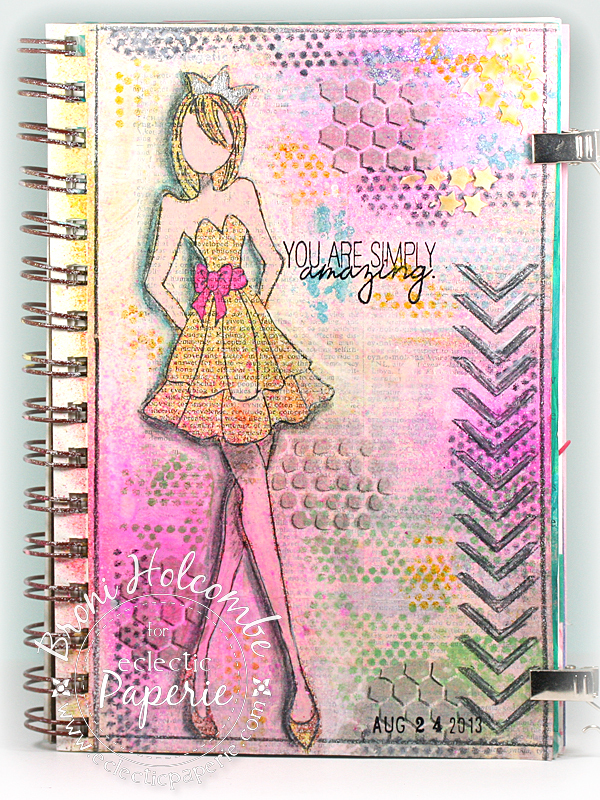 I've just gotten this awesome new Prima Strapless Doll stamp in my last eP order and just HAD to use her! 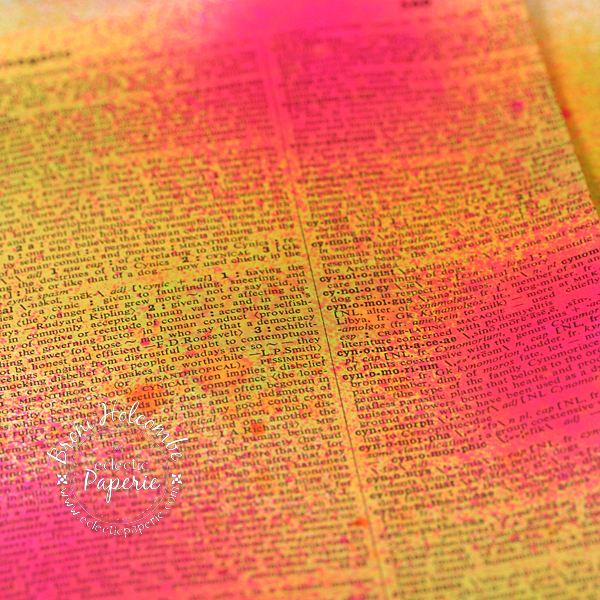 Also, Kim had sent some great old book pages too, so I wanted to use a piece of the dictionary page as well. 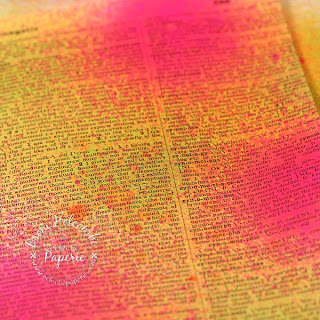 I adhered the dictionary page to my journal page with Studio Matte Multi-Medium and when it was dry I spritzed it with a few Dylusions ink sprays (bubblegum pink, fresh lime, and pure sunshine). 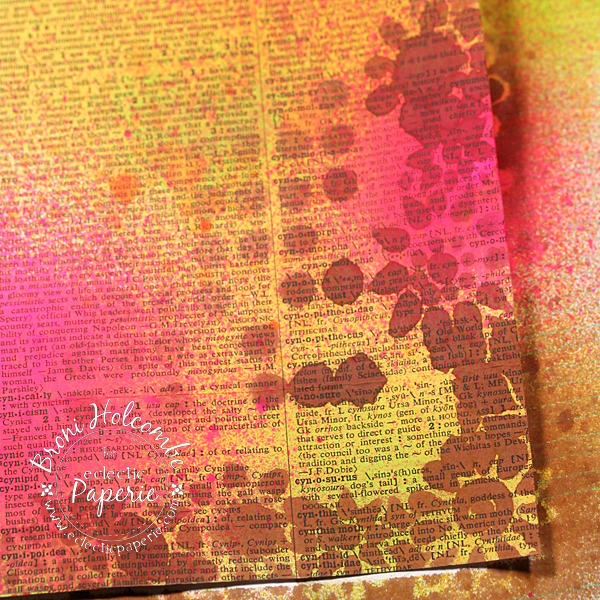 Then I used some melted chocolate spray along with my Dylusions Dotted Flowers stencil in the bottom right corner. Next I spritzed with some white linen spray and then stamped my Strapless Doll in Archival Jet Black ink. Then, using a brush and some watered down Gesso, I painted everything but the doll with 2 coats, allowing them to dry in between. 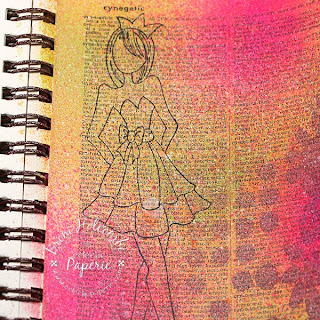 I just wanted a hint of the color and print to show through on the background, but more so on her dress. I also painted her skin using some Gesso and a tiny bit of the Modern Red paint. This photo shows the page before the second coat of background Gesso. Now, here is where the creative juices took over and I was having so much fun that I forgot to take step-by-step photos! Sorry! I can, however, tell you what I did. I used a mini punchinello stencil and some melted chocolate spray, and added shadows with a black watercolor pencil. I used the Tiny Circles stencil (totally inspired by Kim's love of it!) and Tumbled Glass, Mowed Lawn, Mustard Seed, and Black Soot inks. I drew an outline with a black watercolor pencil around the page, and then used the black pencil and a teal one to shadow down the left side of the doll. I also used the black watercolor pencil to color in one row of the mini chevrons stencil. I colored her sash with some bubblegum pink ink and a brush, and used my silver leafing pen to color her crown. 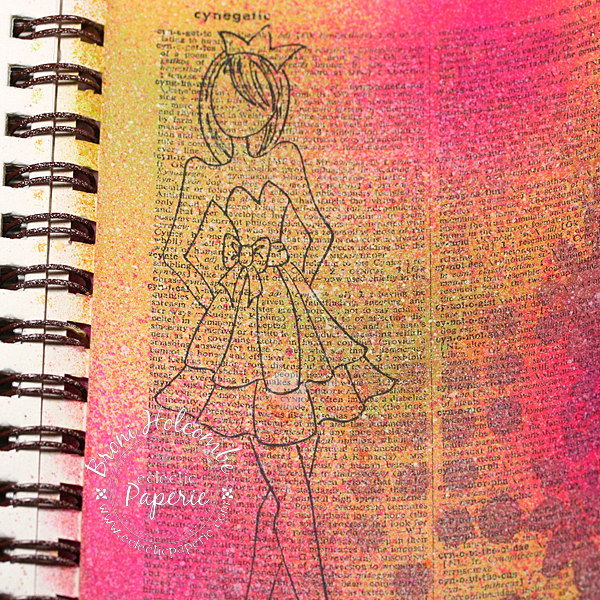 I added the stars with the punchinello stencil and some Studio 490 embossing paste. 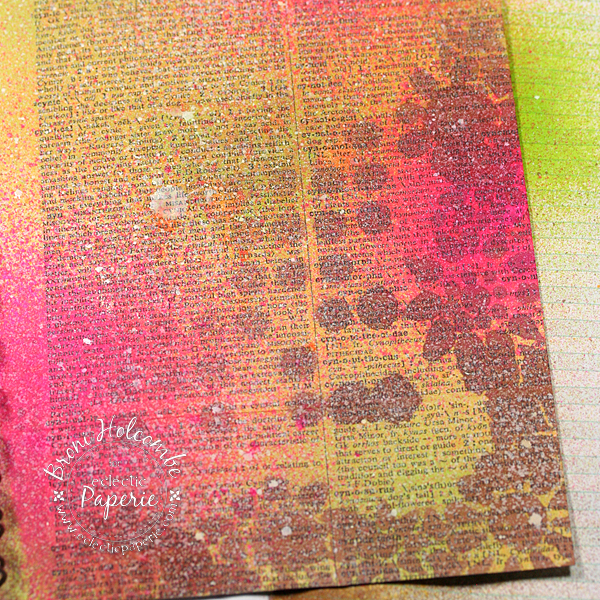 I think it's neat how the yellow soaked into them from the underlying journal page. Lastly, I stamped the sentiment from the WPlus9 Quite Like You stamp set and stamped my date on the bottom of the page. I hope you like my page and that you enjoyed seeing and hearing about the process. I sure had a good time creating it! Thanks for stopping in to have a look today! Wow, this has become a gorgeous page!!! You made a lot of movements to come to this! Love the dimension you achieved here, Broni. It looks totally 3-D. The layering of the stencils makes for such a great background. Love her dress....I would not have thought of watering down the gesso to use as a wash. Very cool. Wow Broni she looks like she is walking off the page...gorgeous ...gorgeous layers and you might have gotten me to crack open the bunch of stencils I have and actually use them,they terrify me lol. Big hugs and have a great weekend. This is terrific, Broni. I love the colours which are a perfect choice for the doll, and I must get that chevron stencil! 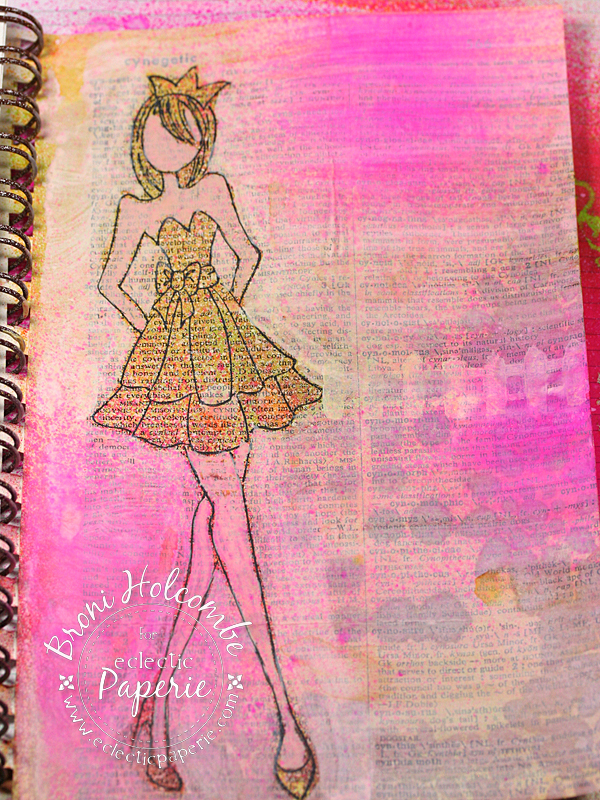 Adore your journaling pages, Broni! 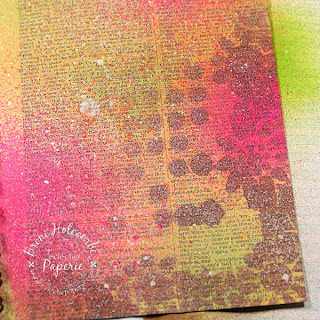 The newsprint is perfect and I love that Prima stamp! Beautiful! I love your step by step directions...thanks! This page is gorgeous!! Love it, wow you combine Julie and Dyan... I got those ... I may have to venture out this week !! Great inspiration and tutorial !! Thank you all for your kind comments, ladies!! I love this simply, yet eye catching cover. Thanks for sharing instructions. I love your page! Thanks for sharing how you created it. Oh I love how you shadowed the stamp. Gorgeous page.... just love it.